I cannot even begin to tell you how excited I was when I was looking in Superdrug and noticed these little beauties hiding all alone on the bottom shelf of a "new releases" stand. I have never heard of the brand Invogue/Eye Candy (Facebook ,Twitter) before, but I couldn't resist such a bargain, and snatched up all 4 colours in the collection. "First to market with a range of Feather effect polishes. This ground breaking polish formulation contains tiny feather like particles that are blended in a range of pastel shades. Giving you a full feathered effect polish." I'm always excited when a new "texture/effect" nail varnish is released, and I certainly wasn't disappointed with these! Basically, these are clear based nail varnishes, filled with tiny feather like particles to give a full feathered look. They actually remind me of the "Hundreds & Thousands" cupcake sprinkles? The 4th, Jaye Bird - Blue & White (Dupe for Nails Inc Cornwall Feathers) is bolder and brighter than the others, but still gorgeous. Each polish applies quickly and easily, although I would advise using a base coat before application to protect your nails from the texture. You will need to apply 2-3 coats to achieve the full effect but this is no trouble as each coat dries really quickly, and actually makes the next coat stick better. Lasting time?... well, they are similar to Glitter polishes, in that they won't chip easily so last longer, but are a bugger to get off! I will mention that the polish dries with a matte finish, and the surface is a little rough, which may put people off, totally worth it though in my opinion! The packaging isn't anything special compared to the pretty design on the Nails Inc. Version, but what do you expect for a 3rd of the price. The bottle shape and brush are very similar, and you get the same amount of product. For now, I think I'm happy with these, and considering ALL 4 polishes only cost me £13.96, compared to ONE at £11! 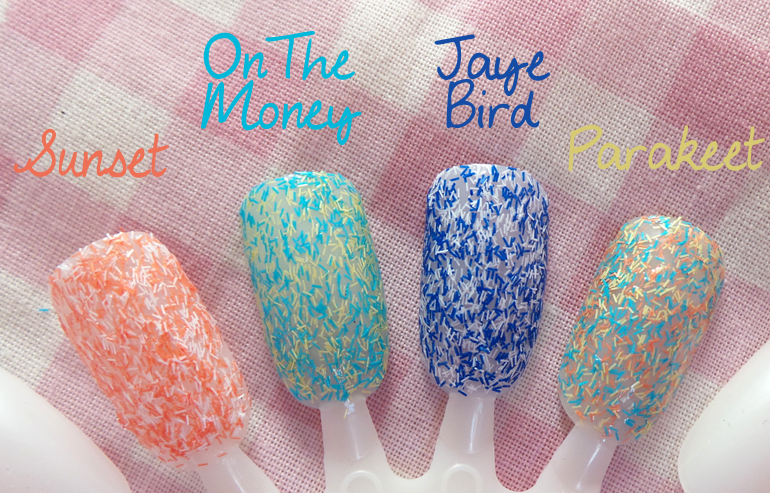 These are the perfect budget alternative to Nails Inc Feathers! I've decided that "Parakeet" is my favourite shade. So I thought I'd show you a completed nail swatch with this one! Has anyone tried both Invogue and Nails Inc? If so, is there any difference with quality/texture etc? These are the first dupes that I have seen, they look really nice! Te best dupes I've seen! And a bargain!! These look really nice, especially the parakeet one. I'd get annoyed that they're not easy to get off and also the catachable texture though. I suppose you could use them on fake nail tips instead and apply a layer of gel or acrylic to the top to make it smooth so they wouldn't catch on stuff. Might have to go out and get the parakeet one because I keep looking back at the pictures of it. I thought they looked like hundreds and thousands too! Your blog is lovely, I'm a new follower on bloglovin'! These look amazing, I wanted to try one of the Nails Inc ones but like you the price tag puts me off. The only thing that is still putting me off slightly is that they are difficult to get off. I decided earlier today that I don't think I'm going to bother with glitter varnishes anymore because of this reason but at that price they may be worth a try. Haul| My First Fragrance Direct Order!